Justin Rupert has done an amazing job in taking on the role of Contents Supervisor in our State College, PA office. Justin’s ability to remain humble and coachable in regards to how he manages his team has been very evident and is a large part of the growing success of our Contents division. 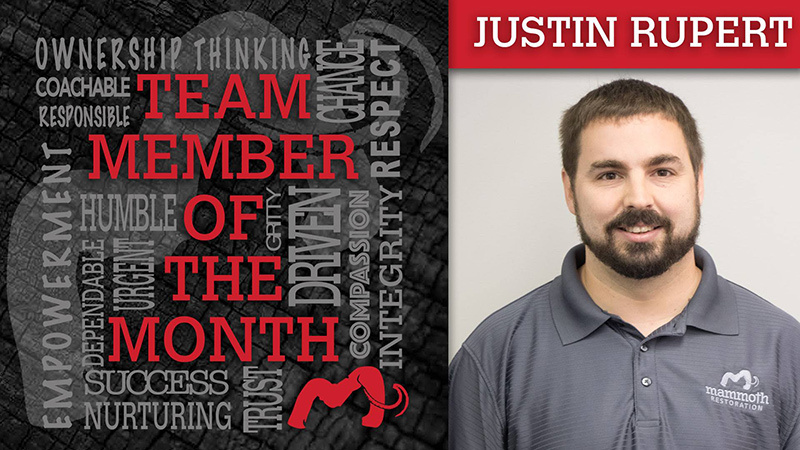 Justin has continued to take ownership of every job he works on, including but not limited to putting our customers first, working long hours, and providing excellent communication with adjusters to ensure we have won jobs that may have slipped away. Justin’s efforts and ability to lead by example continue to help our contents division become a high-performance team. Interested in working at Mammoth Restoration? Click here to apply. My favorite part about working at Mammoth Restoration is how our culture allows us to speak up and call each other out. It’s actually encouraged here. I feel like if I was as assertive at another job as I am here at Mammoth it would be frowned upon and I’d probably get into trouble instead of praised. My favorite thing to do outside of work is playing baseball with my Son Colton. In my eyes, he’s the best baseball player to ever play the game! What are you going to do with your extra $250.00 Team Member of the Month Bonus? I was introduced to Dave Ramsey at the beginning of 2018. Since then I’ve been very focused on being debt free. That being said I’ll put it towards my debt to get there faster! What fellow team member do you look up to and why? I look up to a lot of my team members as I feel like we are a big family! One team member that I can think of that I really look up to is Dale Troxell. He’s a single father like myself, and he’s a great father! I know how hard it is to do it on your own! Where do you see Mammoth Restoration in 5 years.. specifically the Contents division? In 5 years I see the contents division having at least 3 more cleaning facilities like we have in State College. I could see us tripling our revenue in the next 5 years as well. I’m excited to be part of this! A lot of people don’t know that I played poker professionally. I enjoy it more now that It’s just a hobby. If you could pick a new skill instantly, what would it be? If I could pick one new skill I would pick speaking in front of groups. I’ve always been uncomfortable doing this. I have two, from two people that have had a huge impact on my life!